Each of us have our own struggles when it comes to the holiday season, but for anyone this can be a challenging time of year. While holidays are meant to be filled with cheer and love, there are so many expectations placed on us, which can become truly exhausting. 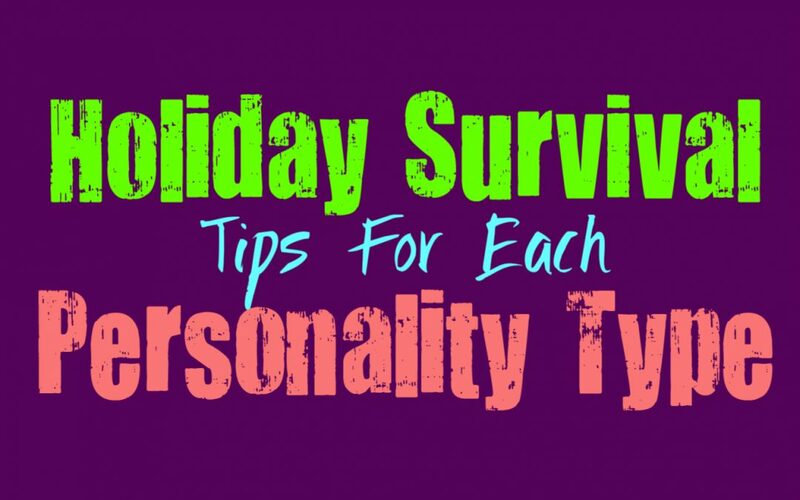 So here are just a few little tips which can help each personality type survive the holiday season. INFJs can certainly become drained by this time of year, and might struggle to really feel in the spirit. They find themselves looking at all the people stressing over gifts and traditions, and might feel it is a bit pointless. The INFJ who has a lot of family expectations placed on them, will have a hard time coping with the holidays. They often feel like they need to socialize and interact, and they find themselves become drained rather quickly. It is important to take some time for themselves, or else this time becomes even harder to handle. Whether they decide to do dishes and clean up to avoid people, or just explain that they are a bit tired- INFJs need to learn to take the alone time they need. It can also be helpful to try and connect with the things they love about the holidays by making new traditions with someone special. Whether this be going ice skating on Christmas Eve, or binge watching cheesy holiday movies- INFJs can benefit from making this time their own. ENFJs are often very focused on being people pleasers, and so the holidays can actually be a lot of work and pressure for them. They often take this pressure with a smile and try to maintain that they are more than happy to handle just about everything, but that doesn’t mean the ENFJ isn’t becoming a bit exhausted by the situation. They take on too much and this can become draining after a while, even for the ENFJ who is capable of multitasking quite a bit. They find themselves overwhelmed with chores and errands, just trying to make the holidays magical for everyone they love. It is important for the ENFJ to ask for help, instead of taking everything on themselves. Having someone who is there to support them and help make things a little bit easier, can really relieve a lot of the stress when it comes time to finishing certain projects and tasks. For INFPs the constant social interaction and traditional expectations of the holidays can be a bit overwhelming. They are rarely traditional people and so being forced to follow these things can be a bit silly for them after a while. While they will likely enjoy being able to spend time with loved ones and spread a more positive energy, there are some things that are a bit challenging for the INFP. Being forced to go to parties is often the worst part, and is something INFPs will want to avoid. The simplest solution is to make time for themselves, and recognize when they are exhausted and really need to step away. It can help to have someone with them as a buffer, someone who can keep the INFP out of the social bustle. INFPs can also benefit from making some of their own holidays traditions, instead of always adhering to what everyone else expects and wants them to do. ENFPs often enjoy many elements of the holiday season, since they do love the positivity and magical feeling it can bring. They are often very drawn to the idea of spending time with loved ones and being able to buy or make each other special gifts. For the ENFP socializing isn’t the problem with the holidays, it is having to follow too many rules and expectations. Feeling like they need to adhere to what others expect of them, can be a lot of pressure especially when it comes from family. Sometimes the ENFP just needs to get away from all of this pressure, and go off on their own with someone who does not judge them or expect anything from them. They need this time to let go of all of these familial pressures, so that they don’t become dragged down by it entirely. For INTJs the holidays can often feel a bit foolish and over the top. They don’t often find themselves drawn to typical traditions, and being forced to socialize is a major drain on them. For the INTJ having to adhere to certain social expectations that the holidays bring, is really not something they will be happy about. They do often do their best to respond accordingly, but it becomes seriously exhausting for them after a while. The best approach for the INTJ is to take it one step at a time, and recognize when they need to get away from everyone and recharge their batteries. For the INTJ spending too much time in crowds is not going to make this situation any better. They need to learn to handle all of their holiday shopping online, and avoid too much of the constant hustle. INTJs also do well having one person they can vent to, someone who actually understands their frustrations about the holidays. ENTJs are often very outgoing and social people, and so there are many aspects of the holidays they are likely to enjoy. They have a great time being able to connect with loved ones, and are good at keeping up with the social settings. For the ENTJ the most tiresome thing about the holidays is that they can actually put a lot of pressure on themselves to please their family and themselves. They have high expectations and often want to be able to live up to them. Sometimes feeling like they need to impress their loved ones can be a lot more pressure on the ENTJ than people realize. They are strong people but that doesn’t mean they don’t have feelings, and so sometimes they really just need to spend time with someone who understands and appreciates them the way they are. Having this special person is the honestly the best way for the ENTJ to survive the holidays. For the INTP holidays can actually be a bit exhausting, since it doesn’t really fit into their natural behavior or personality. INTPs don’t always comprehend why people become so obsessed with traditions and following them to the letter. They often prefer to try new things, and so seeing everyone wrapped up and obsessing over each little detail, can seem slightly foolish to them. INTPs need to find a way to make some of their own holiday traditions, ones that don’t fit into the expectations of everyone else. Having these special things which are all their own, can be a great way to celebrate the holidays on their own terms. INTPs also need to recognize when they are feeling social drained, and find a way to sneak away for a bit. Sometimes breaking the rules just a bit, can help the INTP survive the sometimes stifling feeling of the holidays. ENTPs can become a bit bogged down with the pressures of the holidays, since there are so many traditional expectations. At the same time they are often good at going with the flow and finding ways to adapt to it. ENTPs simply need to make some time to break the rules a bit, without it upsetting anyone around them. They need to free up some space in their schedule to enjoy the holidays in their own way and on their own terms. ENTPs can often handle doing certain things in order to make their loved ones happy, as long as they get some time for themselves as well. Being upfront about some of the things they need or want for the holidays, can help the ENTP reach a compromise which can make the experience a bit better. For ISTJs holidays are often something they are comfortable with, since they do enjoy traditions. They don’t mind having certain rules or expectations and can live up to these fairly easily. For the ISTJ the most challenging part of the holidays is not having much time to themselves to recharge their batteries. All of the social interaction and constantly feeling people all around them, can be a bit exhausting after a while. Having an escape plan can be the best option for ISTJs, and this often helps if they have at least one person they can share this with. Whether this be some sort of excuse for why they must leave, or a signal to have their loved ones help them exit early- it is important for the ISTJ to take this time they need so they don’t become overexerted. For ESTJs holidays can be enjoyable, especially since they are traditional people. They enjoy being able to celebrate with their loved ones, but something there can be a lot of pressure to this. ESTJs often have a lot of expectations to live up to and this can become draining after a while. They don’t want to disappoint anyone, but sometimes they can become stressed about having to spend too much money and ensure everyone is provided for. At the same time they want to make everyone happy, so this combination of wanting to be frugal and generous can be challenging for the ESTJ to navigate. They simply need to take a step back and breathe, and learn to find the balance. Their loved ones will appreciate whatever they do for them, but learning to shop for deals can be a great way to relax the ESTJ. ISFJs are often very drawn to the holidays and the traditions it upholds. They enjoy being able to make this time truly special for themselves and their loved ones. For the ISFJ the idea of celebrating with everyone is not something that stresses them out or bothers them at all. Most ISFJs truly enjoy the holidays and treasure the nostalgia and traditional feelings.The hardest part of the holidays for the ISFJ, is simply the fact that they get very little time alone and can put a lot of pressure on themselves to make it perfect. They need to learn to take a few moments just to breathe, and even do something which relaxes them. Understanding that without this time they can’t properly care for others, can sometimes help the ISFJ prioritize their needs for the sake of everyone else. For the ESFJ the holidays are often a magical time where they can really celebrate their favorite traditions with the people they love. The hardest part about the holidays for the ESFJ is simply the amount of pressure they put on themselves. They often want to make the holidays perfect for everyone around them and this can become overwhelming after a while. It is important for the ESFJ to take time for themselves, and to remember to breathe. They can benefit from taking a day off, where they just do something fun with someone they love. They also need to remember to ask for help, instead of trying to take everything on themselves. ISTPs are not often traditional people and so being forced to adhere to certain holiday expectations can be a bit draining. For them it is important to find time for themselves, and to not be afraid of expressing that they need this. ISTPs aren’t really fans of having to answer too many personal questions, and being around family often calls for this. Coming up with very simple answers beforehand can help the ISTP avoid feeling uncomfortable or even being a bit sarcastic. For the ESTP holidays aren’t often the worst things, since they do enjoy celebrating and having a good time. Sometimes the pressures of their family can be draining though, especially when they continue to place expectations on them and ask prying questions. Having basic answers prepared can help the ESTP avoid long discussions, and also help them to avoid losing their temper. ESTPs also benefit from having a buffer, someone who will help them direct the conversation elsewhere when they are clearly feeling anxious by the situation. ISFPs often enjoy certain elements of the holidays, but at the same time they don’t like monotony. For the ISFP it is good to have their own special non-traditions, ones that they don’t share with everyone but just share with someone special. Being able to try something new each year and share a special new experience with someone they love, can help break away from the rules and expectations that everyone else has for the holiday season. ISFPs also need time to themselves, but sometimes they gain this by simply knowing how to be the wallflower of the family. For ESFP holidays can be a fun and exciting way to connect with their loved ones and celebrate the magic of the season. They often enjoy throwing parties and having a great time, and can navigate this time with ease. The biggest thing for the ESFP is being able to share this with their loved ones, and so it is important that they express this to others. If they feel ignored or neglected the holidays won’t be a special time for them, and they need to make this clear to the people they love.